Catalan food, as observed by my friend Sebina, can be a little heavy sometimes. This mainly comes down to a love of recipes involving beans, especially in conjunction with lots of pork products. 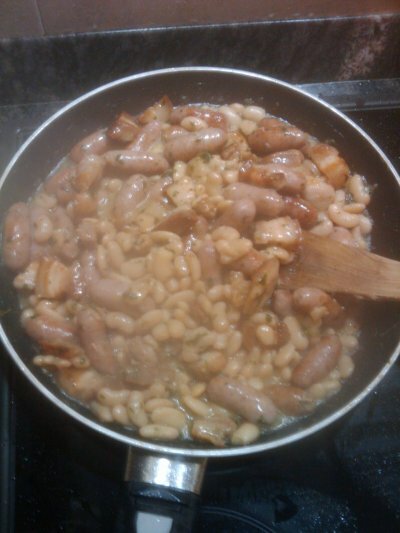 A classic combination is Botifarra amb Mongetes, sausage and beans… but that’s a tad dull if you ask me. Instead, I prefer ‘Beans a la Catalana’, made with either mongetes (big white beans) or fabes (young green broad beans). This is my made up recipe for Mongetes a la Catalana, another great rustic dish for wintry days and evenings. The measures are based on serving four or five people. About 700g of good Mongetes blanques. Go for ‘ganxet’ type as these seem to be better. When I say 700g, I mean when they’re still in their water, in the jar. Strain them but do not wash them. Heat a nice amount olive oil to medium-high temperature (around level 5 on my cooker) in a large, heavy frying pan. Add the panceta, making sure to add plenty of salt (it’ll be a bit tasteless otherwise). After a minute or two, add the sausages. Fry the meat for 5-10 minutes, until it browns. Ensure the oil doesn’t get too hot and that the meat doesn’t burn. It might well spit a bit at this point (the fatty panceta does like to ‘pop’ from time to time). When browned, remove the meat with a slatted device, and place in a bowl. Let the oil cool down a little bit before continuing. Get the heat down to medium/medium-low. Now throw the garlic and parsley into the pan. If you got the oil temperature right, it’ll fry but not burn immediately (that happened to me the first time I tried this). Fry for about a minute. Now add the strained beans and stir together for another minute. Here, I like to add a dash of white wine, just to provide a bit of liquid to the dish. Don’t add more than a glass. When the wine has reduced down, add the meat again. Cook it all together for about four or five minutes (keeping the heat really low), and that’s it. Serve a fairly small portion in a bowl with pa amb tomaquet and a glass of decent red wine. This dish is filling, warming and really yummy. Hope you enjoy it!